LinkedIn Groups was a great invention and, I think, remains the best way to source on LinkedIn. A member can belong to up to 50 groups, send messages within the group for free and post jobs for free. The groups are undergoing a major redesign where the News are now blended with Discussions. You also see a moving row of posts with images and can vote on the posts you like. At the moment of this writing – July 9,2010 – some groups are keeping the old user interface and some have moved to the new user interface. Another major change is that now you can’t include a group membership in your people search if you are not a paying member. The pay for searches that include groups is quite high. 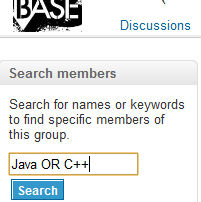 It’s useful to narrow down on group members! Do you have to upgrade now? Here are some points to review, before you do. (replace “SAP” for your own keywords). It’s interesting to see what is the next feature to become paid on LinkedIn. What are your guesses?